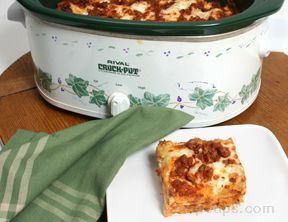 A slow cooked lasagna that the flavors just melt together while it cooks. 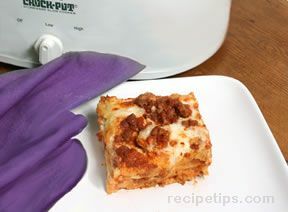 Perfect when you don't have time to bake the lasagna when you get home, it's ready to eat. Be careful not to over cook this. In skillet, crumble ground beef and Italian sausage, cook with onion and garlic over medium heat until meat is no longer pink; drain. Add tomato sauce, water, tomato paste, salt and oregano to meat; mix well. 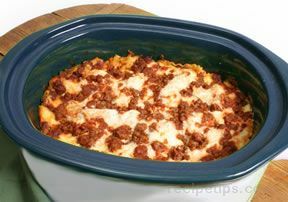 Spread 1/4 of meat sauce in an ungreased 5-qt slow cooker. Arrange a third of the noodles over sauce, breaking noodles to fit in cooker if needed. Combine the cheeses in a medium bowl, spoon 1/3 of cheese mixture over noodles. Repeat layers twice. 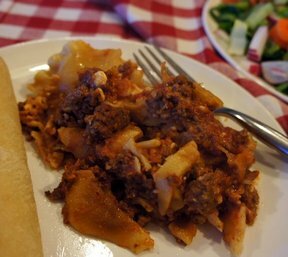 Top with remaining meat sauce. "Great flavor, even though I did over cook it. The edges got a little too done, but it was still delicious."